Shining Ocean has a full line of products for Foodservice and Food Processors. We make both traditional and clean label/no phosphate surimi seafood products suitable for use for natural applications. 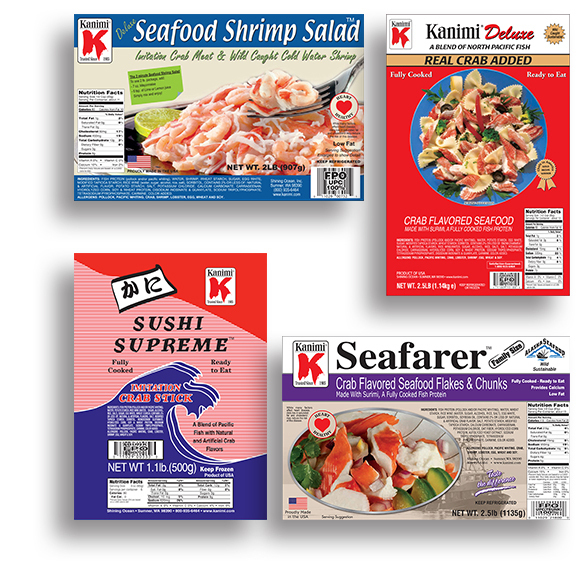 Our products come in all styles and varieties, including hard to find items like smoked salmon and surimi scallops. Our sushi sticks and shredded surimi are the top choice of discriminating sushi chefs. Our flakes and chunks are the industry standard for salad makers and deli cases coast to coast. Or, try our Shrimp Seafood Salad to spice up any salad, dip or sushi item. Seafood shrimp salad is a 2.5 lb package of surimi seafood flakes, shreds and MSC certified cold water shrimp from the Oregon coast. This product is popular in a wide range of applications from seafood salads and dips, to sushi rolls and even ceviche. Taste the difference in quality. Your customers will love you for it.